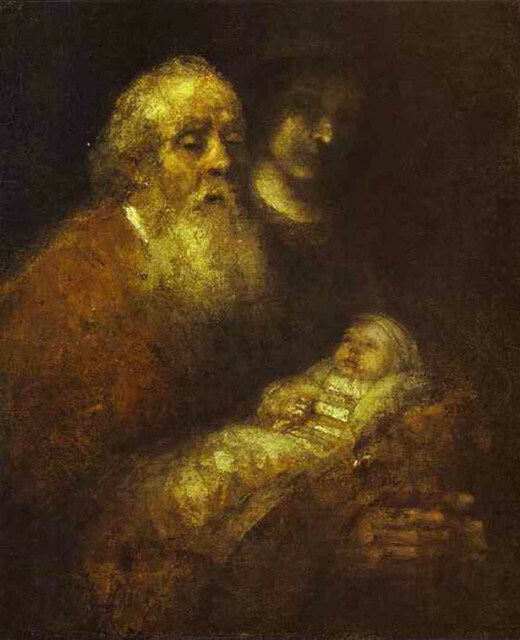 Simeon was an old man, and he was faithful. Every day of his long years he worshipped his people’s God with his people’s prayers. And he knew his people’s stories: he knew how once upon a time a nomad named Abram had heard a voice saying ‘come, leave everything and be mine.’ He knew that voice had promised things: promised triumph and adventure, promised danger and heartache but also life in abundance among an ever-growing family — the Jewish nation, working and living together off the sweet fruits of the wide land given by the one mighty and generous God to whom the voice belonged (see Genesis 12). Simeon also knew the dark underside of that same story: he knew that his people, in service of comfort, or pleasure, or power, had often rejected God and gone chasing after false divinity. Had amassed money and privilege at the expense of the weakest among them, had left widows helpless on the street, had resisted the life of righteousness towards which their God relentlessly invited them. And yet God never gave up. In fact he had promised that one day he would send a Messiah, an anointed saviour to set things right and rule justly over this promised land of Israel where Simeon now lived. And Simeon would not die before he saw this Messiah. God had promised that, too. That’s where we find Simeon in today’s reading: a devout Jewish man at the end of his life, sure in his heart that he would live to see God’s anointed. Now, you and I might automatically picture the Messiah as kind and merciful, because that is what Jesus was like and how he is portrayed in the statues and the paintings that we pass by every day without thinking. We are likely to hear this story and think how fortunate Simeon was, how delighted and eager he must have been for that joyous moment when his own two lucky eyes would see this bounteously kind redeemer who was to come. But here, by contrast, is what the Hebrew Bible has to say about the Messiah: ‘who may abide the day of his coming? and who shall stand when he appears? For he is like a refiner's fire, and like a launderer’s soap.' That is from our first reading today, and there are plenty of other passages in the Old Testament like it. Simeon would have known these scriptures, and he would have known that God’s Messiah, when he came, would wipe sin off of the earth like a wildfire tearing through dry forest (Malachi 3:2; cf. e.g. Isaiah 63). And perhaps he wondered, privately, whether he would withstand the blaze. Maybe, just like you and me, Simeon looked into his heart and saw that no matter how hard he tried to be good he still fell short. Maybe he still spoke from time to time with impulsive cruelty or stepped heedlessly over a beggar in the street on his way to temple. Simeon prayed and prayed, but was it ever enough? Ask yourself: is it ever enough for you? No matter how much you pray or meditate or donate to charity, do you ever escape the feeling that on some secret level you do not measure up? I am not trying to guilt you. Just the opposite: I am trying to stand at this altar with you and confess that every last one of us on earth feels a nagging fear that, if we are going to be judged on our moral merits, we will not pass muster. You and I carry scars of guilt and memories of failure, and so, I bet, did Simeon (cf. Psalm 14). In which case, what must Simeon have felt when the Holy Spirit told him to go meet God’s chosen one? Not exhilaration, I would guess. If I were he, I would have sprinted in the opposite direction of the temple. I would not want to stick around to find out whether this avenger of sin was going to decide that I needed to be scrubbed out of existence like a filthy stain out of a clean shirt. Simeon was destined not to die before he saw the Messiah. But given what he knew about God’s judgment, he might well have wondered whether this encounter was exactly what would finally do him in. Still, when he heard the call he went. Simeon entered the temple with fear and trembling, and there he met a small family carrying their son of forty days old to consecrate his birth. They were too poor even to bring the usual offering for the ceremony. And that is how Simeon, on the day when he thought he was due to meet the scorching flame of God’s righteous warrior, found himself staring instead into the eyes of a naked peasant boy. When is the last time you locked eyes with an infant? Mine was four years ago, when my sister's son was born. I thought of Simeon on that day, because never in my adult life had I ever, even in the presence of my dearest friends, been looked at with such utter acceptance. A baby has no knowledge of anything you have done wrong; he does not know about how complicated you are and how afraid you get sometimes. He is not searching you for the cracks in your armor or evaluating the sincerity of your feelings. He is completely innocent of all those sad realities and he just looks at you and wonders, will you love me? And you think, well, I guess I have no choice. Perhaps on that day when he met Jesus, Simeon had an experience something like that. Perhaps he looked in the eyes of a newborn Christ and discovered: God is not going to destroy sin by destroying us along with it. No, God is going to wipe our shortcomings out of the world by disregarding them entirely, by looking at us as if they never existed and had no bearing whatsoever on our relationship with him. God embodied himself for Simeon in the person of a child, looked at him with the nakedness of infant eyes and asked only, will you love me? And Simeon thought well, I guess I have no choice. Then Simeon sang words which we sing every week in this chapel: ‘Lord, now let your servant depart in peace.’ Peace indeed, for Simeon and for you and for me. Do you come to this altar with burdens? Are you haunted by some terrible mistake or some stupid thing you said yesterday? Did someone tell you every day while you were growing up that you are twisted and condemned? Is someone telling you that still? God knows all of those things, but he has chosen to look at you as if he did not. God is here for you as he was for Simeon and it is my high honour today to tell you this good news: he is here with infant eyes that will burn away your sin into nothing. He is here as a refining flame and a newborn child, a face that looks at you and does not see your shame. Come be seen, and then depart in peace.